Libra wrote: . . . This picture is so big, im afraid i need to make a condensed version that you can click on. Here's one I did recently. The Model is my female avatar on Second Life. And I use corel's paint shop pro. This is a new world map I have been working on for my Magnor setting. This one i actually used different layers for. I also tried using some textures to make the map seem a little more real for the base ground color. I also experimented with a gausian blur function , which I had never tried before with the ocean. Turned out really nice I think in the end. Though i was constantly stumped on how to draw forests and Mountains on the map. 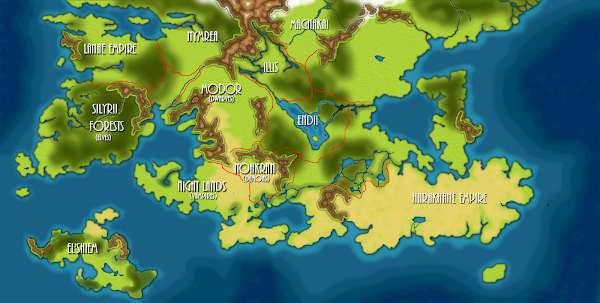 Because Paint shop Pro, doesn't really have cartography utilities.